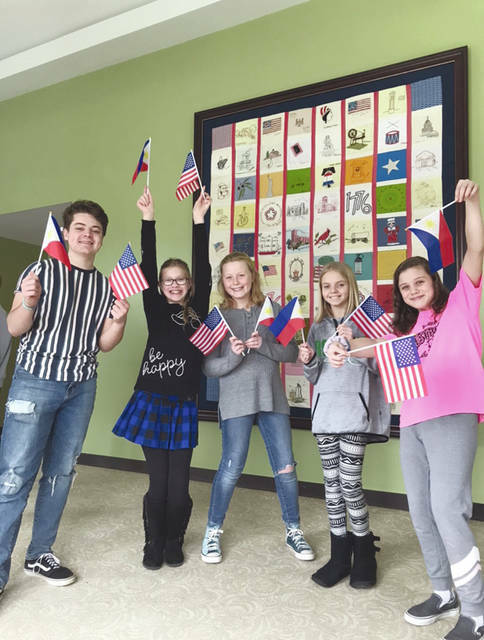 Provided photo Owen Davis, a junior counselor, poses with the rest of the Philippines delegation, including Bianca Stevens, Emersyn Sivon, Audrey Prenger, and Caroline Klawon. On Sunday, March 10, CISV Miami County held their annual Presentation of the Delegates Tea. Families and friends gathered to acknowledge and congratulate the delegates departing this summer and winter for peace education camps around the globe. This year, CISV Miami County will be sending delegates to Guatemala, Great Britain, the Philippines, Norway, Massachusetts, and Texas. The age range of programs offered this year spans from 11-18. Bianca Stevens and Caroline Klawon are two 11-year-old delegates who will be traveling together to the Philippines this summer for the organization’s most well-known program, “Village.” Existing since 1951, this 28-day camp brings together four-person delegations of 11 year olds, accompanied by an adult leader, from 10-12 countries for a fun and educational summer camp experience. “I am excited to just meet new people, learn about other people’s customs and their way of life everyday, and I’m also excited to learn different languages, too,” Stevens said. https://www.dailycall.com/wp-content/uploads/sites/30/2019/03/web1_CISV.jpgProvided photo Owen Davis, a junior counselor, poses with the rest of the Philippines delegation, including Bianca Stevens, Emersyn Sivon, Audrey Prenger, and Caroline Klawon. Mollie Bretland is a Troy High School junior.